BARCELONA, ESP – The headline of Huawei’s launch program at Mobile World Congress is not a smartphone, but a laptop. Over the last two years Huawei has introduced itself to the PC market by way of the Matebook line, and the halo product for 2017 was the Huawei Matebook X. For 2018, Huawei is introducing the Matebook X Pro, responding to feedback from its customers and going for a more premium product. Despite the slight change in the name, there are some significant changes under the hood. The obvious promotional headline for the Pro 2018 model over the X 2017 model is the upgrade to Intel’s 8th generation Core-U processors, known as Kaby Lake Refresh. This means, for the 15W TDP parity between generations, the new design will offer up to four cores with hyperthreading using the Core i7-8550U for no extra uptick in power. With the Pro 2018, users will have the choice between the Core i5-8250U (quad-core with HT, 6MB L3) or the Core i7-8550U (quad-core with HT, 8MB L3). 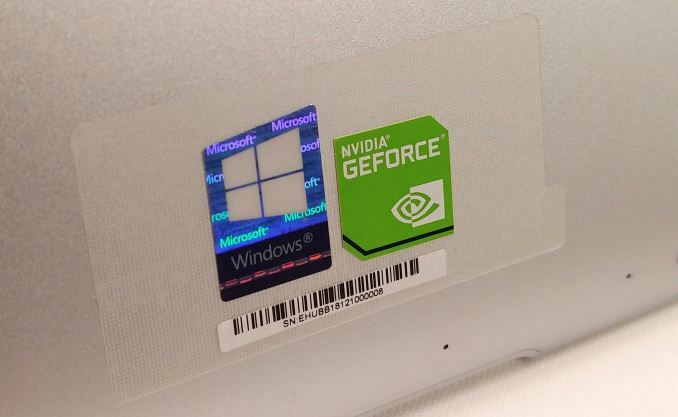 The Core i7 model affords additional benefits, such as an integrated NVIDIA MX150 graphics GPU as well. Systems will be available with up to 16GB of LPDDR3 memory, and up to 512GB of NVMe storage – exact breakdowns of which configurations will be presented at the launch event. Huawei is promoting several distinct features with the Matebook X Pro. The 13.9-inch LTPS/IPS display has a 3000x2000 resolution and covers 91% of the physical area of the lid, made possible through 4.4mm bezels and a relocation of the camera. The type of display leads Huawei to quote 450 nits brightness, 100% sRGB coverage, and a 1500:1 contrast ratio. Also quoted were the 178-degree viewing angles, to which we were told that using the device on in a public place or in the air absolutely requires a security screen. Normally with these sorts of displays, the webcam is relocated to the bottom of the display, but still embedded. 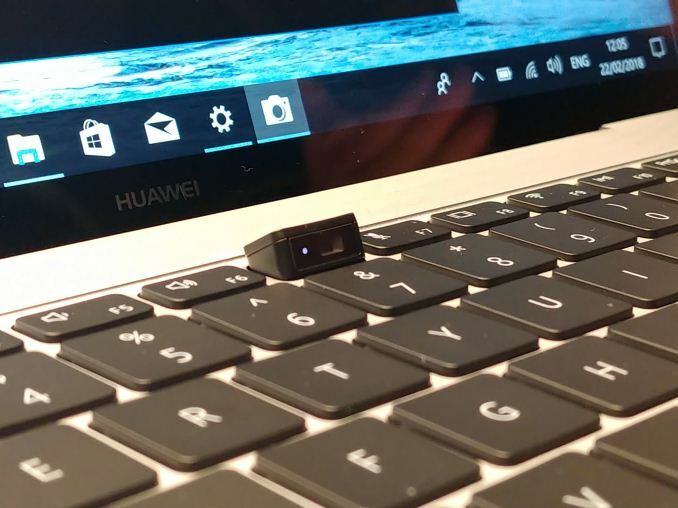 Huawei’s solution is different, and fell under the heading of security: it pops up out of the keyboard. 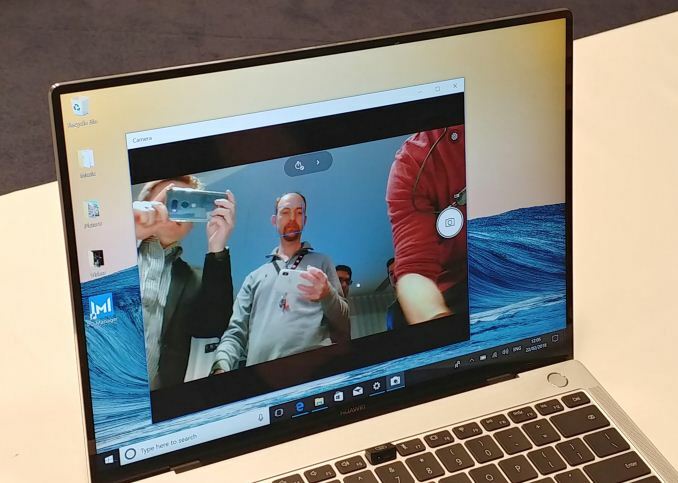 It was stated to the press that Huawei’s research showed that 35% of individuals physically cover the webcam on their laptops, which goes higher with professionals – this research lead Huawei to develop the pop-out concept. The camera looks like one of the keyboard chicklet keys and sits between the F6 and F7 buttons – it sits on a spring latch, with a press causing the camera to pop up like a headlamp. When closed, the camera is automatically covered, which is where the security aspect comes in. It is a nice idea, most likely requiring some specific design choices under the keyboard to make it happen, but does have the same drawback as any other bottom mounted keyboard: any professional going for a job interview is going to give a full view of their nose and chin(s) to a prospective employer. There isn’t a security screen for a megapixel of nostril hair. On the keyboard and trackpad, Huawei likes to promote that the Matebook X Pro features the largest clickpad on the market for a 14-inch notebook, as well as spill-proof, full-size keyboard that is also backlit. Having used the 2017 model, I can confirm that having a large clickpad is a good thing, although my personal preference does tend towards physical mouse buttons. Above the keyboard is Huawei’s combination on/off button and fingerprint sensor, using a similar Goodix design to Huawei’s smartphones. For the 2018 model, Huawei is quoting that the button/sensor can both turn-on and fingerprint validate into an operating system with one press, with the fingerprint data being captured at the beginning of the POST process and held in an independent security chip, finally being passed to the OS when ready. Huawei quotes a sub-8 second time from a fully off-machine to Windows 10 entry. For connectivity, the Matebook X Pro has a single USB 3.0 Type-A port on the right, and two USB Type-C ports on the left, joined by a 3.5mm jack. The two Type-C ports both accept data and power, one of which is also Thunderbolt 3 enabled, supporting external displays and external graphics cards. Huawei quotes the system supporting up to a GTX 1080. The wireless solution is Intel’s 802.11ac dual-band AC7265 controller, and Huawei has bundled its Wi-Fi Direct based ‘Huawei Share’ software, allowing for direct connections to Huawei smartphones for fast file transfer without using a cable or the cloud. On the battery, Huawei quoted a 57.4Wh capacity, featuring its latest generation of ‘Power Saving Management Technology’, although the company gave no details as to what this entails. We were unable to determine if it is a hardware solution or a software solution, the latter of which comes into play when non-Windows based OSes are used. We were told that this increases the battery efficiency by 15%, but again, the way the metric was calculated was not mentioned. Huawei did state that the USB-C fast charger supplied in the box can provide 6 hours of light use with a 30 minute charge, by using similar techniques for charging as it does with its smartphones. Huawei was keen to point out the audio setup, with the Matebook X Pro being Dolby Atmos certified. The device uses a quad-speaker setup in the design, but with a split frequency implementation – two speakers are tuned for bass, and who speakers are tuned for higher frequencies. The speaker chambers use a double suspension system to compensate for vibrations, and the speakers beside the keyboard were said to provide a better front-facing experience. This brings us to the first part of the story of this launch: to a certain extent moving to KBL-R is not much more work than a drop in for the old processor, but by enabling an MX150 version means that the 2018 edition is not fanless, which was one of the big selling points of the 2017 model. This has upsides and downsides – one of the issues we found with the Matebook X was that due to its design, the thermal performance could vary, especially when the networking hardware was running for sustained periods at peak throughput. With the Matebook X Pro having fans, it should allow the processor to turbo for longer periods as well. The only downside is that it has a fan. The fan intakes are somewhat hidden on the bottom of the design, with one each side. The fan outtake by comparison is found within the hinge design of the clamshell. While having a fan is ultimately a deal breaker for a user like me, it does remove one of Huawei’s premium talking points about having a U-series processor in a fanless high-quality design. I wonder if Huawei chose not have the MX150 as an optional element in the configurations, if the fan would still be needed. That being said, in our very quick testing of the device, we did some power and frequency monitoring, and while the CPU did hit 15W, it seemed that the PL2 (turbo power limit) of the device was also set to 15W, so the Core i7 CPU only hit 2.8 GHz maximum, rather than the official 4.0 GHz turbo, which requires a PL2 setting of 44W. This isn't uncommon (Acer Swift 3 has PL2 of 32W), but a factor when moving to 8th Gen processors and a consideration as to if a fan is involved. The second interesting part of the launch is the power delivery mechanism. The way the power is delivered was not explained all that well: both Type-C ports on the side can do both data and power, but only one is Thunderbolt 3 enabled. If we skip over the fact that Huawei didn’t state if this was an Alpine Ridge controller or Titan Ridge controller, or that it was only quoted to support up to a GTX 1080 and not a GTX 1080 Ti with no explanation, the way that the power management has to take place is a little confusing. Normally with a suitable TB3 setup, the dual port TB3 controllers can manage power in both ports – but one of these ports does not support TB3. This would mean that either Huawei does have two ports from a single TB3 controller but decided (randomly?) to disable TB3 support on one of the ports, or that only one is coming through the TB3 chip and the other one has a separate power management system for charging the battery, which would ultimately increase cost with additional components. Huawei has made an odd design choice here for sure, and it is not clear which route the company has taken without getting out my screwdriver. Unfortunately I was not allowed to take one apart in our briefing. We did not get to check at the briefing, but I hope the memory is in dual channel mode. I actually used the original Matebook X for a month as my daily notebook. Unfortunately I never got around to writing anything about it, but for a 13-inch Core-U series fanless device, it suited pretty much all my needs, better than my aging ASUS Zenbook Ultimate I was using at the time that suffered from ‘sharp edge wrist slash’ problems.. Having a premium notebook, compared to the bulky monster I had four years ago, certainly makes a difference when you are on the road. 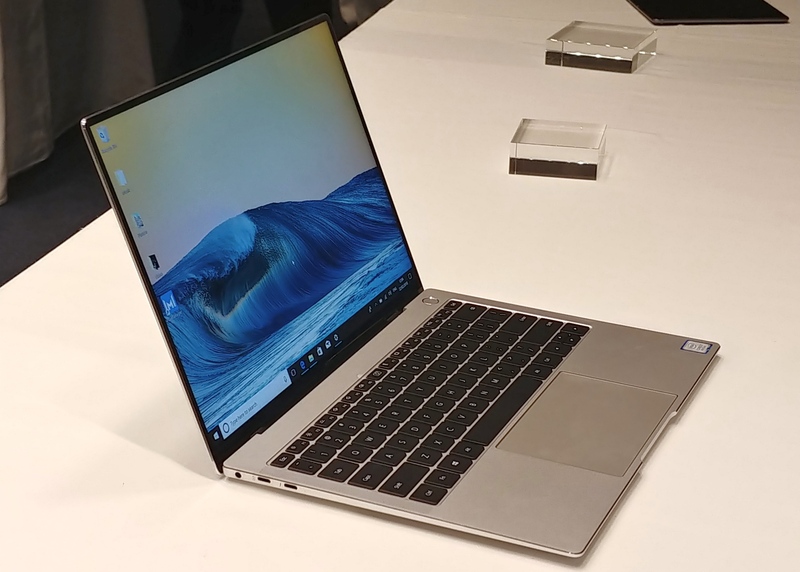 But the key points for the Matebook X Pro (2018), over the Matebook X, is the increased display footprint, the 450 nits brightness, the spring-latch webcam, Thunderbolt 3 connectivity, a device of this size using Type-A and Type-C, the quad speaker system, the fingerprint sensor, and for those that need it, the NVIDIA MX150 graphics. It comes at the expense of moving to a fan-based design, however. Huawei will be announcing pricing and availability at their keynote event at Mobile World Congress. We will update this article when we have the information. Huawei will be launching three models at different price points. The first markets that will get the Matebook X Pro will be China, US, Saudi Arabia, Germany, Spain, Italy, and the Nordic countries. Coming from Q2 2018. Why hasn't the notebook segment transitioned to LPDDR4 yet? Is it because of the supply issues making it more feasible to either go LPDDR3 or full DDR4?